…what started last month as a little toe-dip into the short story pool ended up being a full-fledged dive off the high dive into the deep end and by the time I came up for air and swam to the side, I realized I didn’t want to get out of the water. I thoroughly enjoyed “Last Night”, but what I really got hooked on was the New Yorker Fiction podcast…and then the Selected Shorts podcast. I love listening to the stories. Last week I realized I was quickly working through the entire backlist of those podcasts and I couldn’t even remember everything I’d heard. But stories by Amy Hempel (“Jesus is Waiting”, “Beg, Sl Tog, Inc, Cont, Rep” and “In the Cemetary Where Al Jolson Is Buried”), Miranda July (“Roy Spivey”), Dorothy Parker (“Here We Are”, “Just a Little One” and “The Waltz”) and Flannery O’Connor (“Everything that Rises Must Converge”) have stayed with me. I do still have a few episodes to listen to, but I decided it was time to start reading. I combed my bookshelves and found these four collections. Happy coincidence that three of them are already favorites. 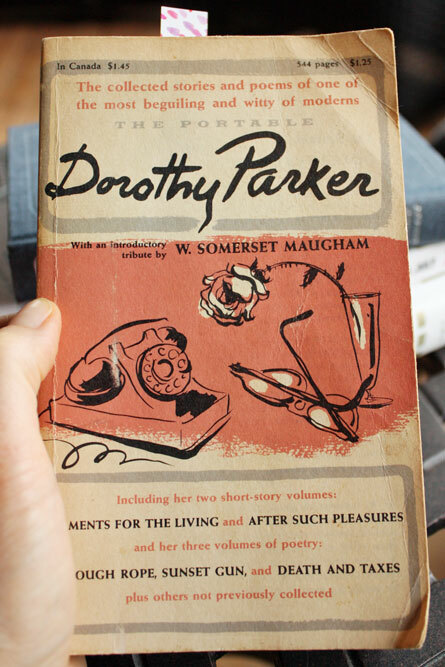 The Dorothy Parker was my mom’s copy. 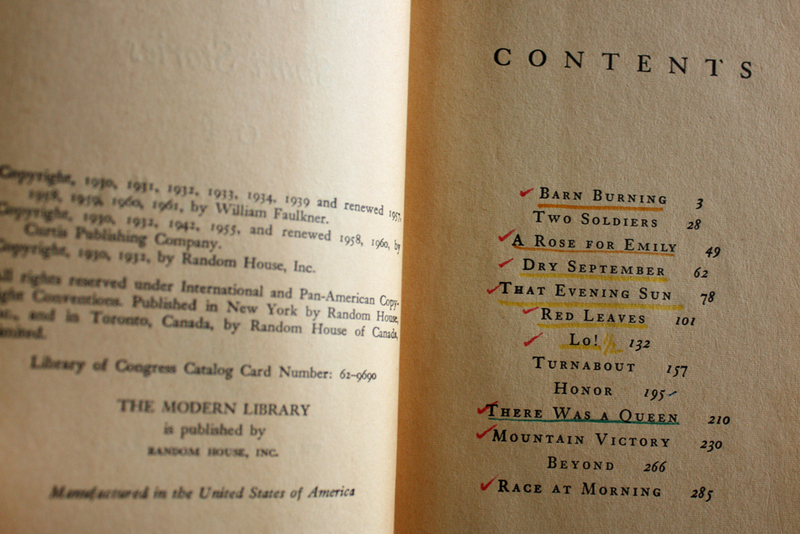 And I’m not sure if the Faulkner belonged to my mom or to my dad. The highlighting makes me think it wasn’t my mom, but I’m sure she’ll let me know! Then you take a deep breath, and slide your head under, and listen for the playfulness of your heart. I’ve enjoyed it in little bits and pieces since then, especially when Katie moved to NYC four summers ago and I read aloud many of the stories as we drove through West Virginia, Pennsylvania and New Jersey. Although I have to admit – the professionals who read the stories I mentioned do a much better job! Ann Kingman is reading a story a day this year. I’m not sure I’m up for that much of a commitment! But I am hoping to read 100, which works out to 3-4 a week and will get me through all four of these books. If I add in the ones I listen to, I suppose I could get to 194?! (which is one a day for the rest of 2013). To help my terrible memory, I’m also going to keep a journal and I’ll share the highlights here. And all this has me curious – do you enjoy short stories? which ones are your favorites? and do you keep a journal to help you remember them? If you're into short stories now I think you'd like Water Street. Anyway, I'm reading Liar's Club right now, which is not short stories but a memoir, but it's very darkly funny and I think you would like it, too! I'll have to borrow the Miranda July when you're finished. I read a piece she did interviewing Lena Dunham for Interview Magazine, and it was fascinating. She has a lot of really interesting stuff to say (well, they both did), but I didn't know she wrote fiction, I thought she just did film. I don't think I've read a short story since I had to in college. I've always liked long winded authors, I guess! I haven't read a short story in a long time…I think I was traumatized by reading "The Lottery" in 6th grade! Only kidding! I usually read longer books and you have made me think about what I am missing in short stories. Listening to Selected Shorts and reading the NY magazines each week (or at least try to get them read), is about all I can fit into my reading time. Ann King has my admiration for her effort and if she links to a story I'll read, rarely to be disappointed. So many works, so little time! The Dorothy Parker stories are so fun! I LOVE short stories! Think how difficult it must be for the writer to contain a whole world in such a short space. i haven't given short stories much though, but probably should. I remember "a rose for emily" from a college class. would make for great listening to on the morning/afternoon commute. James Salter's "The Last Night" and A.S. Byatt's "A Stone Woman" http://www.newyorker.com/archive/2003/10/13/031013fi_fiction are my two very favorite short stories! I haven't read a short story since Steven King's Different Seasons! (1982!) Though I have The Lottery here at my desk and I think I'll read it today! 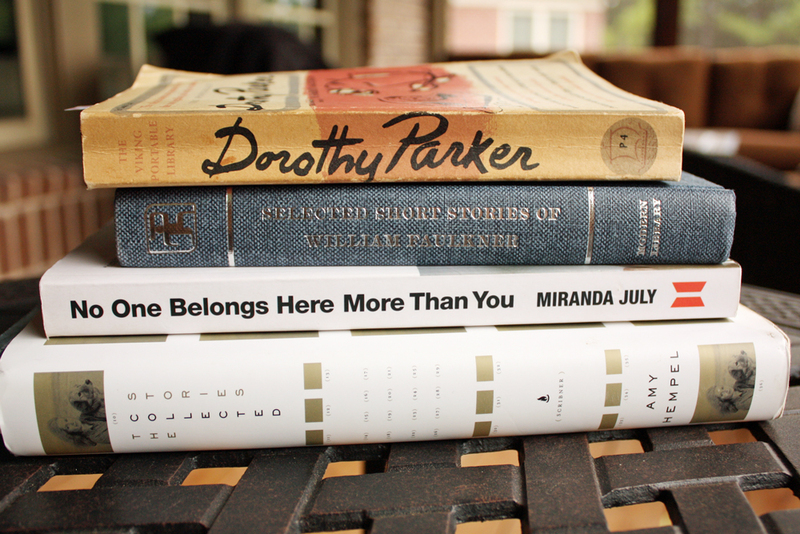 I'm going to find me some Dorothy Parker though I think and look into some of the others you've got here. Thanks Mary! LOVE short stories! (Actually my favorite genre. I love the way an author can convey deep meaning with the fewest words and details. Perfection!) Ann King. Dorothy Parker. Alice Munro. Tolstoy. Ernest Hemingway.